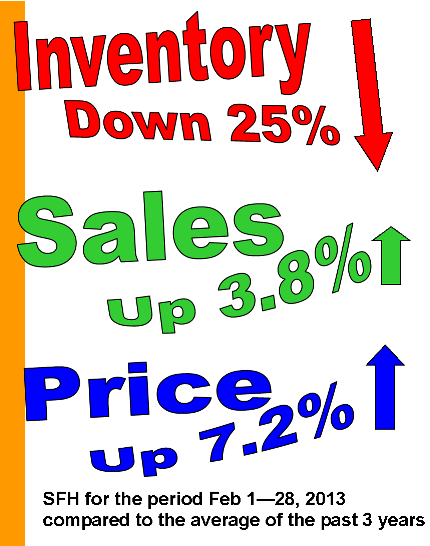 Even with inventory down by 25%, sales were still up by 3.8% in Feb compared to the average of the past 3 years. The average price hit an all-time high for Calgary at $518,452 but it’s well-known that I put more credence in the median price, which hit an all-time high for Feb at $437,500. It’s still $1500 less than the record high of $439,000 in Jun 2007. First-time buyers were up 6.8% compared to last year. There’s a huge demand for homes priced under $500,000 with an absorption rate of 1.3 which means there’s a 39-day supply of homes on the market. Last year in this price range, there was a 60-day supply. For homes priced above 500,000, there’s a 111-day supply. Bidding wars are going strong, with 17% of homes selling for list price or higher in the last four days of the month. This entry was posted in Bidding wars, Market update, Month-end. Bookmark the permalink. Calgary RE still pretty hot. Is Edmonton as hot? Sales in Calgary are also 6.3% down from last year. Last few month’s sales were all higher than 2011/2012 so this marks the first time in a while where sales are down YOY. Is it because of low inventory or are the new rules really starting to affect sales? Judging by the sales on comfree (about one in one thousand sells) this is a buyers market for life. Should oil retrace back to the days of the Reagan era that would also be a strong negative for real estate.